That’s what George [Lucas] told me. Me, Natalie Portman, and George’s kids—we were at Wembley Arena at Michael Jackson’s concert. We were taken backstage and we met Michael. There was Michael and Lisa Marie [Presley]. George introduced me as ‘Jar Jar’ and I was like, ‘That’s kind of weird. Michael was like, ‘Oh. OK.’ I thought, ‘What is going on?’ After Michael had driven off, we all go back up to a big afterparty. I’m having a drink with George and I said, ‘Why did you introduce me as Jar Jar?’ He said, ‘Well, Michael wanted to do the part but he wanted to do it in prosthetics and makeup like ‘Thriller.’’ George wanted to do it in CGI. My guess is ultimately Michael Jackson would have been bigger than the movie, and I don’t think he wanted that. 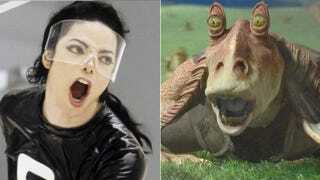 As god is my witness, I have no idea if Michael Jackson yelling “MEESA SORRY!” would have been better than what we got, worse, or the exact same amount of terribleness. The mind boggles.